Three out of four members of our household have a serious glitter fetish. The fourth (we won’t mention names) grumbles about the glitter trails left behind us, the glitter on the scalp, the glitter period. But he’s outnumbered and our love of glitter just continues to grow. We’ve been making simple handmade Christmas cards over the last couple of days and have indulged ourselves by making our own glitter tape designs. Start by tearing off pieces of the double sided tape and pressing them to your card in any design desired. Leave the top protective paper on for now. Once your tape design is complete, peel off the protective paper on one or more of the tapes—any that will be the SAME color of glitter. 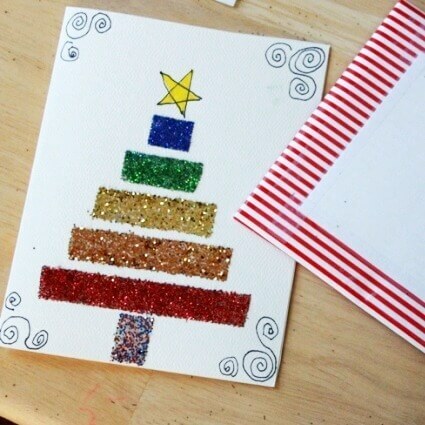 If you’re going to use multiple glitter colors, leave those others covered for now. Note :: Maia (8 years old) could pull off the paper from the double sided tape okay, but Daphne (4 years old) had trouble so I did that part for her. …until it looks mostly covered. Tip the card and shake off the excess. Peel off the protective coating on any tape pieces that will be your next glitter color, sprinkle on the glitter, and shake off the excess. I made a rainbow-colored Christmas tree. Daphne liked it so much that she made one, too. And I have to admit I made a few myself. The whole process was rather addictive and I think the glitter tape look is so pretty! I got tired of cutting off the edges of the cards to fit into our too-small envelopes, so started wrapped them in wrapping paper instead and sealing the edges with washi tape. It was so easy (I didn’t bother with cutting out an envelope-shaped template, just wrapped it like a present) and so festive! Maia made a glitter wreath card for her great Grandma. This DIY glitter tape technique is great for straight lines, but when it comes to curves, we’ve decided that a glue stick is the way to go. Daphne made a glitter “fire making contest” card (top left) with boys on one fire-making team and girls on the other. We all added washi tape borders, designs, and elements to many of our handmade Christmas cards. Btw, I have yet to try glue dots or the roll-on tape, but I think either would work great with glitter! cute cards! Homemade cards are the best! You always the most wonderful ideas! These cards are so adorable! I love it! There are never enough ways to use glitter. This is lovely! I just might do it today! I love these!! we gave them a go and they look beautiful. Thanks so much for sharing!! coolest clutches available this fall. The laptop bag is becoming no different from any other female fashion accessory. I think glue dots would work well. You could put them in a circle to make a wreath. My kids will love this. Oh and the glitter in the hair thing is so true. It doesn’t even wash out in the shower. My little one gets if from the princess dresses. These are so nice Jean. We are going to try Menorah versions. Thanks for the inspiration!